All materials Copyright © 2002 Flathead Raft Company. All Rights Reserved. 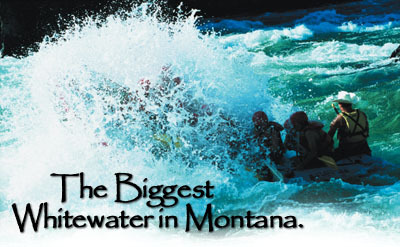 Experience Class II and III rapids including the famous Wild Buffalo Rapids of the Lower Flathead River, the biggest, most consistent whitewater on the warmest river in the state. Choose between a paddle raft where you provide the power, or oar raft where your guide does all the work. $39 - seniors (60 and older). Tribal members subtract $2.67 with ID.